My 2 Games now in 32 Bit versions, playable on new computers! Thanks to our own tremendous Sergio Cornaga I was finally able to make playable standalones of Storm Is Coming and Le Sunset Salto. They should run on new systems, as opposed to the old 16 bit versions. Enjoy, spread the word, let me know if they work. The sun is going down, this is going to be your last salto of the cliff. But when you go under, everything is different; everything becomes an adventure in this magical hour. There are 8 different endings. Mermaids, Octopodes, Jellyfish, a Whale, Sunken Ship, Crabs, a Fisherman, an island with palmtrees. EDIT: Bug fixed, updated version posted. Thanks Sergio, as always! EDIT 2: Octopus Bug Fixed in LSS, Room leaving fixed in SIC, updated versions posted. EDIT 3: Achievement screen fixed. EDIT 4: Achievement screen now really fixed. EDIT 5: Achievement screen now really really fixed. EDIT 6: Achievement screen cleaned up and hints hopefully fixed. EDIT 7: Rock clipping bug and bottom transition from the fisherman fixed. Ever since my last update I have been working on the game almost every day, encouraged by your comments. I have added a ton of new levels (and also deleted some unnecessary to make room for more among the 255 available), details and so on... I have also been working on the backstory, which I am afraid to say is getting darker and darker. Graphically I have started lately making more interiors,as you can see attached. But it really wore me out, especially that I have to incorporate more and more "action" elements which mean programming, failing, reprogramming without an end... So I will be taking a short break now and probably restart next year. I need a pause with these endless obstacles and also the everso more depressing narrative. But worry not, I love the project like a 3rd baby and will complete it for sure! It is just more exhausting than I initially thought it to be. As always, lots of pixellated love for you dear crazy computer peoples and keep creating! 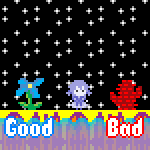 It has been half a year since my last information on my game in progress, "Poor Thing". Since then I have maintained a fairly steady pace in development and added a lot to the game, however there is a looot of work still in front of me. I have calculated that I still have more or less 100 levels to add. I have 178 levels in my game so far, but some of them are placeholders and some more can be cut out. If no other obstacles emerge, I should be able to fit my game within the planned maximum of 255 levels. While still adding new levels, I alternate it with either fleshing out already existing locations or finally adding some action sequences. I worked out a way to make objects standing in the middle that can be either walked in front of or behind, which adds a lot of 3d feeling to the game. At the same time I am working on the story and characters, because I really mean it to be a complete tale, with beginning, middle and an end. Things are constantly falling into place, or switched around if they do not work. I think I am rambling, but I am really excited that I have kept at it so long and do not feel bored or intend to stop. I calculate it will take about a year to complete and add details to all the levels, then probably another year to interconnect everything, hunt bugs, beta test and add sound effects and probably some music. A long, long way... but almost every other day I keep developing it further. I hope 6 months is an enough long pause not to be pushy with my project. Truly said, I often have to fight the urge to share every new detail that I am proud of, with you lot! I go back to working on the game now. As always, lots of love to you lovely people, and keep creating! It has been a long time. As you may easily check, the last thing I submitted was three years ago. Through this time I have not been dead but had to redirect my priorities somewhat. I was busy, making music and minions. However, already in 2010 I started working on a project, only this time I wanted to create something gigantic. I have been working on it since, in short bursts of creative passion. It is slowly taking shape. Due to the self-imposed scale of the project, it is going take a long time to complete. It is hard to tell if I am even halfway through. I intend to use all available levels. Did you know there is a level limit of 255 in KNP? I checked. There is going to be a backstory, a mystery, a mythology, a bestiary. There is going to be creepiness, solitude, heavy, brooding, melancholic atmosphere. Since the beginning of this year I made a decision to work on the game at least every other day. The optimistic release date is within 1 year. The pessimistic/more realistic version is 2 years from now. Although I did not have much time lately, I have been popping by from time to time. I love yous dearly. I hope I will finish the damn thing. It is big and complicated and frightens me sometimes. Dear everybody, I proudly present my new game. Three months in the making (waay too long for a game this short). Featuring lots of jumping / saltoing / swimming action, underwater creatures, "transparent" sprites and lush MIDI orchestration. I have been playing it over and over to get rid of bugs but probably dozens of them are just waiting to be discovered. Well, I do not care anymore, just wanted to share it at last. You start by jumping off a cliff, and if you know what to do, soon you embark on an underwater adventure! Watch your oxygen! If you don't know what to do, there are hints and even a step-by-step walkthrough which honestly takes away all the fun, so use it only if you really have no idea what to do. There are two achievements to earn, and for completing each you gain access to a special prize! (of course you can gain it immediately by checking in the .gam file but you are too noble and honest to do that, aren't you). Let me know what you think, I didn't have any beta-testers available except my wife who said it is pretty but nonsense. If you find any bugs I will be more than happy to fix them and repost a better version. EDIT: Bugs removed! If you really want to know which bugs, highlight the following:Jumping from the rock to catch the mermaid is now only possible after the mermaid jumps. When caught by the octopus and unable to move, it switches to Game Over after 3 seconds. As for the duplicating chracter - sorry, for now I have no idea how to get rid of that. Chances are if it happens one time it won't the second.Big thanks to sergiocornaga for fishing out (badum tschhh) the bugs.